As world leaders prepare to gather in Palermo for the Libya conference on 12 and 13 November, Libyans are wondering what this much-anticipated event will achieve. The international community’s record in Libya is hardly encouraging. The UN’s attempts to broker peace since 2014 have been an abject failure, aggravating an already calamitous situation. More recently, the international community’s efforts have been hampered by the ongoing squabble between Italy and France over who should dominate the Libya file. While this upcoming conference is about the search for peace, it is also Italy’s bid to seize back the initiative from France, which pulled the rug from under Rome’s feet with its Paris conference in May. The agreement that emerged from that conference set a ridiculously over-ambitious timetable for the political framework, with elections earmarked for December. With this timetable in tatters, the Palermo conference is Italy’s way of reasserting its role, and it is racing to convince as many world leaders as it can to attend the event. Italian Prime Minister Giuseppe Conte has been at pains to express that this will be “a conference for Libya and not on Libya”. This is a welcome sentiment. Throughout much of its history, Libya has been at the mercy of foreign powers. From the Ottomans, to the Italian colonisers, to the British, and to regional powers today - not to mention the various “solutions” imposed on it by the UN - Libya’s destiny has often not been its own. Yet, it is hard to square Conte’s statement with news that the UN is set to present yet another new plan for Libya at this meeting. Although details are still under wraps, this plan is believed to include a new timetable for the political process that will push elections back until next year, as well as new measures to deal with the security crisis in the capital and to revive the flailing economy. Once again then, the international community wants to impose a plan on Libya that sees elections as a panacea for the country’s ills. So far, there is nothing to suggest that this gathering will offer anything new. It is true that Italy has championed an inclusive bottom-up approach, in contrast to France’s more top-down style, which brought only a handful of figures to the table. Rome has invested considerable diplomatic energy in inviting a broad range of Libyan participants, including Field Marshal Khalifa Haftar, who recently accused Italy of being an “enemy”. Yet, while a more inclusive approach is welcome, bringing more groups to the table will not, in itself, translate to a better outcome. The bitter reality is that those with power on the ground are still not ready for peace. In a country where political culture is grossly underdeveloped, the sense of national good has been subsumed by the politics of the town and tribe, with each bent on defending its own interests at all costs. There is still no power or institution capable of transcending these divisions, and as the state works as a cash-cow, channelling money into the pockets of all and sundry, there is little incentive for these local power brokers to accept anything that could upset the status quo. Moreover, all of these forces, many of whom have been legitimised by the international community, have authoritarian tendencies. They are also imbued with the mentality of revenge, which has permeated post-Gaddafi Libya. It is not just Libya’s polity that is shattered, it is Libyan society as a whole. Meanwhile, the catalogue of human rights abuses, committed by all sides in this conflict, has been swept under the carpet. Talk about elections in such an environment appears risible at best. Furthermore, the various powerbrokers who keep being wheeled out as representatives at international gatherings are in no position to deliver peace. 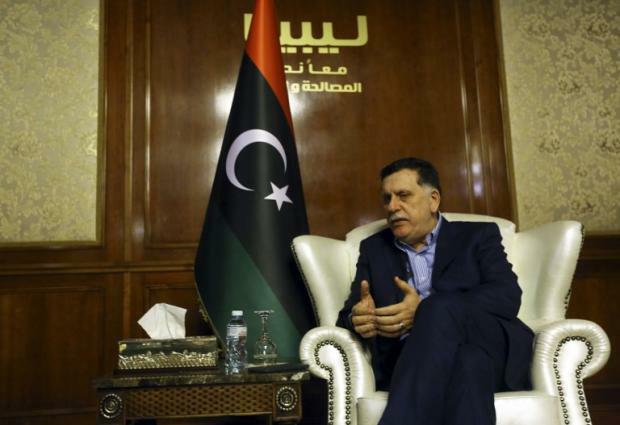 The head of the Presidential Council, Fayez al-Sarraj, is a powerless individual in a powerless institution that has failed to gain any real legitimacy in Libya. As such, his hands are tied by the array of militias that are holding the capital to ransom. Despite various efforts to reconfigure these militias as professional forces, they are still essentially ragtag armed groups that operate at whim. Also powerless is Khalid al-Mishri, the head of the High Council of State, another institution that was born out of the UN peace process and dead at inception. What was once the backbone of western Libya - the alliance between Misrata and the mainly Islamist forces in the capital and beyond - was shattered long ago, and Misrata is so divided and demoralised that it cannot wield the influence it once had. Indeed, there is no single power in western Libya capable of delivering peace. Haftar by contrast is a power in his own right and has the east under his control. This has created a major imbalance in negotiations. Yet even Haftar’s reach is limited, while his personal ambitions and autocratic tendencies have made him a divisive figure. The fundamental issue that has been at the core of Libya’s conflict since 2014 - the role that Haftar should play - has yet to be resolved and is still the key obstacle to the country unifying. While the various representatives may go through the motions of attending the Palermo gathering there is little chance that this conference will succeed where others have failed. Even if France and Italy can put their differences aside, the international community’s continued attempts to force the different Libyan components to work together under a UN-imposed plan is more likely to prove counterproductive. This is not to belie the enormity of the challenge facing the international community. Libya’s conflict has become so intractable, and so very complex, that it will take a near-miracle to facilitate a comprehensive and meaningful peace. However, the insistence on continuing down the same path for want of a better alternative is not a solution, and risks dragging out Libya’s crisis even further. - Alison Pargeter is a North Africa and Middle East expert with a particular focus on Libya, Tunisia and Iraq, as well as on political Islamist movements. She is a senior research associate at the Royal United Services Institute (RUSI), and a senior associate at global consultancy firm, Menas Associates. Photo: Members of the Libyan security forces loyal to Khalifa Haftar man turrets mounted on the back of pickup trucks in Benghazi on 24 October, 2018 (AFP).